Available in standard and "Moon Crux" editions. Fate/Extella: The Umbral Star will launch in Europe and Australia in January 2017, Marvelous Europe announced. A large, high-quality presentation box, complete with a premium finish. 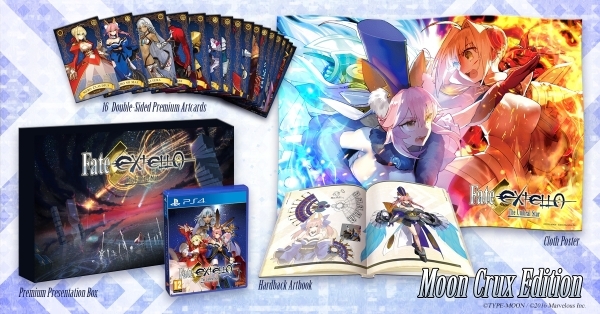 The standard edition of the game will be available both physically and digitally across PlayStation 4 and PS Vita, and pre-orders at participating retailers will include 16 collectible art-cards. If you’re at the MCM Expo in London this weekend, Fate/Extella: The Umbral Star will have a limited, once-a-day stage show at the PQube booth where the public will be able to see some exclusive, hads-on gameplay. It will also be playable at the Paris Manga and Sci-Fi Show from November 4 to 6 at the Rice Digital Stand. In Japan, Fate/Extella: The Umbral Star is due out for PlayStation 4 and PS Vita on November 10, and in North America, it is due out in early 2017. Watch a trailer below. View a set of images at the gallery.